These are precise information corresponding to the results we obtained, the patients must be responsible to adhere to the advantages and disadvantages of the SuperSight Surgery after surgery. Would you accept SuperSight Surgery, if you had the choice again ? Do you always need glasses for distance ? Do you always need glasses for reading ? 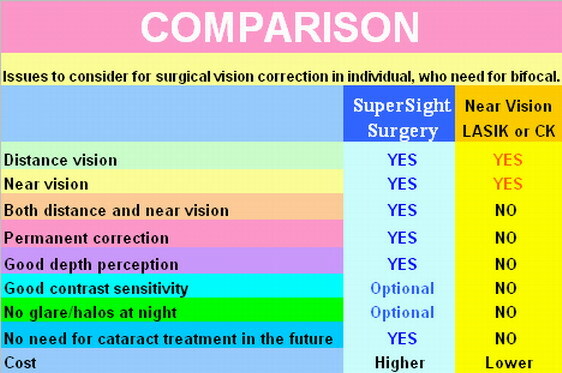 Are you satisfied with the SuperSight Surgery ? Minimum distance (in centimetres) required at different ages in order to see nearby objects clearly without reading glasses. From around 45 years of age, the near vision of almost all people distinctly declines. This is not caused by any sort of visual defect, but rather a perfectly natural, age-related process whereby the lens of the eye loses mobility. For that reason, the eye becomes unable to adjust clearly to different distances. Blurred vision, especially at close range, is the result. with multifocal contact or intraocular lenses are now available. performed using technologically delicated eye surgery. The treatment is completed in 30 minutes, and the actual surgery takes in just a few minutes. Several different treatment variants are possible with the SuperSight procedure. We will advise you about the variant which suits you best. Unlike conventional LASIK treatment, multiple precisely calculated focal points are created in the eye by multifocal intraocular lenses. This results in a good depth of field and very high quality vision at all distances. Visual acuity typically improves very rapidly following treatment at a rate faster than the case of LASIK treatment. 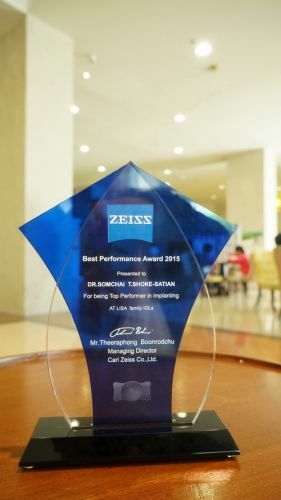 Extremely safe as a result of treatment with technologically advanced Trifocal intra-ocular lens system. Why do I need reading glasses? 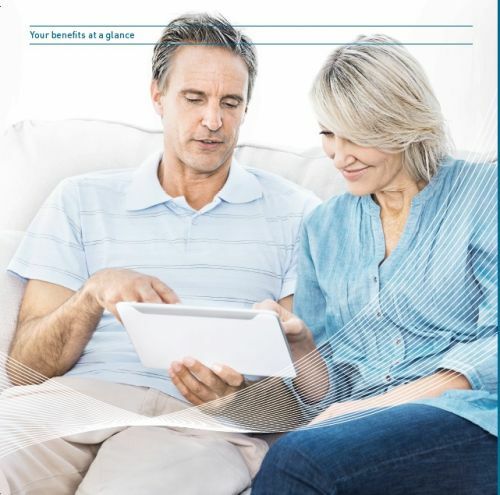 People over 40 years old gradually lose the ability to change focus from distance to near and the need for reading glasses is a natural progression of aging. The first signs are the fact that you have to hold the book or newspaper further away to be able to read it, and you also find that you need a good light to be able to see the words clearly. Eventually your arms are not long to be able to read the words clearly and involuntarily end up buying reading glasses. Although this was called “reading vision.” It is the vision we use for checking the bills, putting on make-up or our daily routine of receiving and checking phone calls from our hand phone. Once you start wearing reading glasses, the days without it is always incomplete. Sometimes one or two or even 3 pairs of glasses may be required and makes life even more difficult and troublesome. As you get older, all the ‘elastic’ tissues in your body become less pliable e.g. knees, lower back, fingers, neck, and most especially your eye lens. This is a gradual unnoticeable changes throughout our life which is mostly occurs until the mid-forties. Normally the lens at birth focuses itself depending on your needs, by the movement of the eye muscles whether near or in far distance, unfortunately as lens aged become rigid and less flexible resulting in difficulty in the muscle to manipulate the lens. The near point focus tends to become further and further and resulted that you need to keep the object away to your eyes to be able get a clear view.